The “Freret Jet” bus route through Uptown New Orleans will be restored to its former end point on Canal Street in a change that transit advocates are hailing as a step toward a public-transportation policy that better balances the needs of both residents and tourists. When the new Loyola Avenue streetcar line opened in early 2013, the New Orleans Regional Transit Authority truncated the route of the Freret bus line to stop at the Union Passenger Terminal, instead of its former endpoint on Canal Street. Riders could then transfer to the new streetcar if they wished to continue onward. Many riders, however, found the change too inconvenient to be worth it — and ridership immediately fell 42 percent, according to an analysis by the transit advocacy group RIDE New Orleans. Critics alleged that the change in service was solely intended to inflate the streetcar ridership numbers, and transit advocates generally complained that the city was prioritizing new streetcar lines for tourists over restoring bus lines for residents. 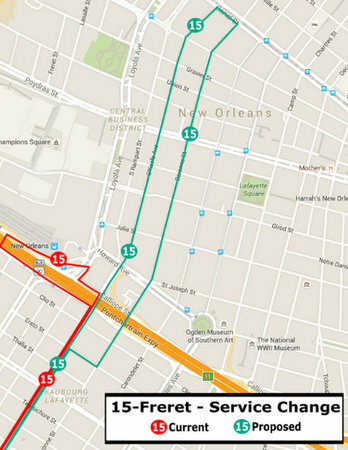 Under the new route, which would go into effect in September, the Freret line will return all the way to Canal Street. It will bypass the UPT on Loyola Avenue completely, instead traveling down O’Keefe Avenue to Canal, then returning back up Baronne Street through the Central Business District before reconnecting with Freret in Central City. The frequency will vary between about every half hour during peak commuting times on weekday mornings and evenings to every hour during midday, from 6 to 10 p.m., and on weekends, according to proposed timetables published online. The change was announced amid a number of other proposals related to the new North Rampart streetcar line. 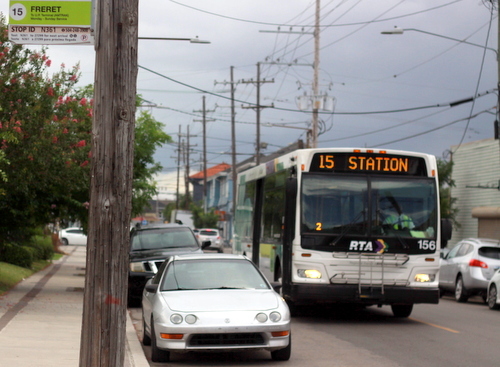 Alex Posorske of RIDE New Orleans said the RTA likely realized that cutting the well-traveled St. Claude bus line would be a poor policy, then extended that logic back to the Freret line. When service is restored, Posorske said he expects that ridership could rebound quickly. The city’s population has increased, more jobs have been added in the Central Business District, and more New Orleanians may begin to see the bus as cheaper and more convenient than car travel and parking. The RTA will begin holding public workshops about the ridership changes starting Monday, July 11. One meeting will be held Uptown, 6:30 p.m. Tuesday, July 12, at the Rosa Keller branch library. View the full schedule of workshops at the RTA website. Finally. They only screwed the common man and woman for just 3+ years. If the powers that be can’t run a bus line correctly, there is no hope. the frequency is still a joke tho to be honest.